Steve Kerr has won 3 championships in his first 4 seasons as an NBA head coach, and the Golden State Warriors are making sure he remains their head coach for the foreseeable future. Kerr had originally signed a 5-year contract worth $25 million in May 2014, and he had 1 year remaining on that deal. This development isn’t surprising, as both sides have been very open these past few weeks about their willingness to get an extension done this offseason. The biggest obstacle was probably going to end up being Kerr’s long-term health prognosis, as he has missed significant portions of time during his tenure. He had back surgery in the 2015 offseason and the complications arising from that forced him to miss the first 43 games of the 2015-16 regular season. Although he was healthy throughout the 2016-17 regular season, he missed the first 12 games of the 2017 playoffs before returning to coach in the NBA Finals. This was one of those cases where if Kerr wanted to continue putting his body through this type of grind and was confident that he could, there was no reason not to do this deal. He has built a coaching staff full of brilliant basketball minds and has cultivated a really enjoyable locker room culture. Players have fun playing on this team, and they’re surrounded by the types of figures that can help them optimize their talents. 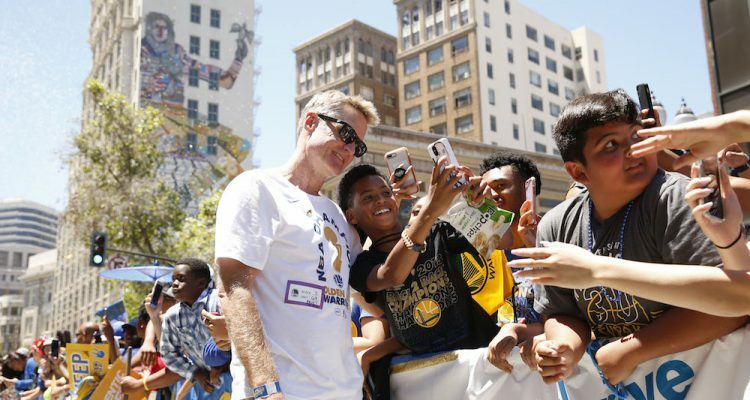 Kerr is a huge part of that positive atmosphere. He’s an extremely thoughtful person, and capable of connecting with many different types of people. The results these past 4 years really speak for themselves, and it’s going to be interesting to learn just how long and lucrative of a commitment the franchise makes to him.